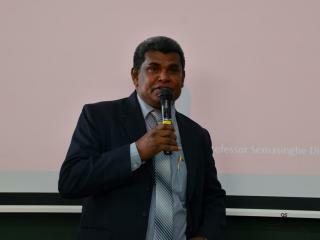 A Sri Lanka seminar was held to commemorate the signing of the International Academic Agreement with the University of Kelaniya, Sri Lanka on April 19. This seminar was held as a lecture "International Technology Development" in the "Global Core Competency Program" that has started from this term. At the beginning, the president D. M. Semasinghe conveyed a message to Shinshu University students, "I would like the students of Shinshu University to come to the University of Kelaniya by all means". 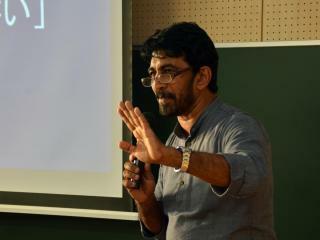 Then, three speakers delivered a lecture. First, Akiko Okumura, Director General of Nagano office of the Japan External Trade Organization (JETRO) explained about "Sri Lankan economy and industry". 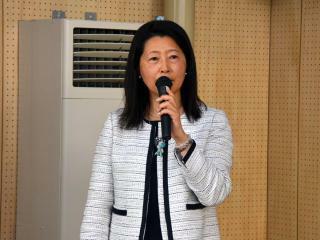 She advised the students always to be ready to look for a business opportunity when they go overseas. 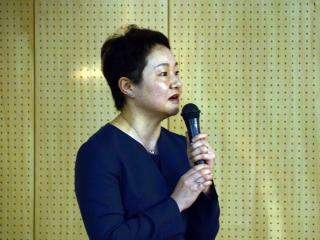 Finally, Ms. Haruko Kamei, Counselor, South Asia Department of Japan International Cooperation Agency (JICA) spoke about "Relationship between Japan and Sri Lanka", introducing various examples of support for Sri Lanka from Japan. About 120 participants listened to the lecture and the seminar ended successfully.